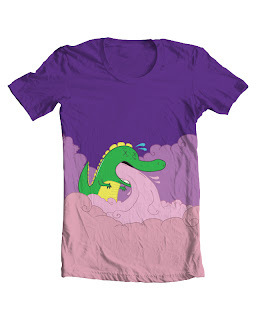 When I first came across the following t-shirt design last night (as always, click on it to take a closer look at it), I was sure the dino that serves as its focal point was supposed to be a Ren & Stimpy-esque re-imagining of one of my favorite game characters of all time: Bub (Bubblun, to some) of Bubble Bobble fame. Sadly, that's not the case. Instead, the green-and-yellow character's name is "Hablaah the Magic Crocogator." Oooooookay. I did that because I'm hoping the design will garner a high enough score to be "printed," as the folks at Threadless call it. Shortly after, I'll buy one of the shirts and then proceed to tell people that the puking creature at the center of the image is, in fact, Bub (or Bubblun, if that's your thing). Should you want to support this endeavor, would you please go here and give Aaron Jacob Willman's whimsical design an appreciably high score? Hmmm, I like you even more than I did before now that you've said that, Simon :) Also, you went and voted on it, right? I MUST HAVE THIS SHIRT!! thank you for posting this! i appreciate your support, and bubble bobble is one of my favorite games, just so you know.